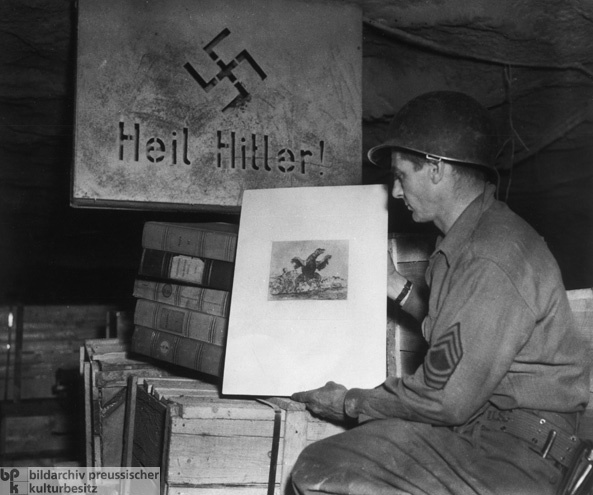 In early April 1945, members of the U.S. 90th Infantry Division discovered an extensive German depot in the Merkers-Kaiseroda potash mine in Thuringia. Among other things, it contained gold bullion and gold coins worth 250 million dollars (including Reichsbank gold), 2.7 billion Reichsmarks in cash, large stores of foreign currency, as well as many art objects (partly from Berlin museums). Infantry members also discovered valuables belonging to Jews who had been murdered in the Holocaust. Given the significance of the find, several high-ranking U.S. military officials inspected the mine on April 12, 1945: General Dwight D. Eisenhower (supreme commander of Allied Forces in Europe), General Omar N. Bradley (commander of the 12th Army Group), Lieutenant General George S. Patton (commander of the Third Army), and Major General Manton S. Eddy (commander of the 12th Corps). The Americans began removing and transporting the treasures to Frankfurt am Main on April 14-15. The photograph shows Master Sergeant Harold Maus looking at the etching El buitre carnivoro [The Carnivorous Vulture] by Francisco de Goya. It is part of the series The Horrors of War and was among the artworks sent to Merkers for safekeeping by the Berlin Museum of Prints and Drawings [Berliner Kupferstichkabinett].